From impromptu family gatherings to birthday party buffets, be prepared for unexpected guests with the best extending dining table. Doorbell rings: disaster’s calling. Your dinner date has brought a friend, and another friend, and that friend has brought their daughter, and the nice man from next door has decided to pop round too. Where could you possibly put everyone without banishing some of them to the garden? It might sound like a situation to disarm even the most seasoned host, but believe it or not, there’s one clever contraption that could help: an extending dining table. Okay, so that might be an extreme example, but even if you’re not having the world and his wife (and their son) round for tea, a folding table can still be a godsend. Whether you regularly host dinner parties for growing numbers of guests, but only have a small space to work with, or you’re a party of two who have the whole family round for one glorious, chaotic day of the year, the best extendable tables give you the option to host at maximum capacity with the minimum of fuss. The big question, then, is which one to go for. If you have little room to spare, carefully consider the footprint of the table both compact and extended, and make sure you choose a piece that looks just as good in both forms, for double-duty dining and decorating. Think about what shapes match the style of your kitchen or diner, and consider an attractive, out-of-the-box oval extending table (although it’s worth noting that rectangular tables do give you the most bang for your buck when it comes to squeezing in an extra chair). Finally, spare a moment to think about materials — from oak to ash, metal to melamine, it’s all here. The secret of the Bramante’s success is in its simplicity. The sleek walnut veneer and pared-down shape give it a polished air, and its extra leaves are kept within the body of the table, making it a good alternative to John Lewis’ Luna for those who don’t have the extra space to store them. Its smooth aluminium mechanism feels sturdy and is simple to use, so it can be converted into seating for up to 10 people with a moment’s notice. Walnut not your thing? Try the matt grey finish for a touch of industrial chic. This table’s mid-century modern stylings, including its distinctive flared footprint, tapered legs, smooth beveled edges and totally on-trend colour-blocking, set it far apart from the competition in the style stakes. The High Pressure Laminate (or HPL) surface is easy-clean and hard-wearing to take sticky fingers in its stride; assembly is minimal, just add legs; and extending is a simple matter of dropping the separate 50-centimetre leaf into the middle. Low-maintenance and lovely-looking to boot. M&S’s Greenwich Oval is a wonderful multi-tasker, at once heavy-duty, versatile, and beautiful to look at. The latter is thanks, in no small part, to its solid oak parquet top, an utterly timeless design feature that adds tons of interest, and is sure to delight for decades. The whole thing is finished with a low-sheen lacquer for under-the-radar durability that doesn’t detract from the table’s classic style, and the positioning of its elegant legs means that no-one’s left encumbered or elbowed out. The smallest option on — and the best budget-friendly extending dining table on our list — Littlewoods’ little marvel is great for solo suppers, bijou dwellings, or even setting up a second dining destination in an otherwise unused space (looking at you, conservatory). Unlike some of the other tables on our list, it doesn’t require extra storage for its extendable leaf, which sits neatly on top when not in use. Need more seating? See IKEA’s Glivarp below for another great value small-space option. While the Glivarp has a slightly larger footprint and higher seating capacity than the Littlewoods Square to Rectangle, it’s still an excellent option for smaller homes. Its slim legs, light-reflecting chrome finish and glass tabletop allow you to see more of the room, giving the illusion of space. It’s also easily converted with just one pair of hands, and the stain-resistant nature of the tempered glass means keeping it clean is easy. More Transformer than table, the Cosmo starts as a minimal console and changes seamlessly into anything up to a 12-seater using any combination of five 50-centimetre extending leaves. Its mechanism is smooth and simple to use, and it feels sturdy even when extended to its maximum. It might not have the visual appeal of the Luna or M&S’ Greenwich, but for sheer versatility, it’s a clear winner. With a range of seating options available from benches to velvet chairs to oak seats, this Bordeaux Solid Oak Extending Dining Table enables you to tailor your seating to your dining room interior as well as your guests. The solid oak build means your getting a table that will stand the test of time, with its resilient table top aiming to withstand the odd scratch and scrape with minimal impact. The crisscross leg design ensures that this table stands out from the crowd on the design front and with the variable range of mix and match seating options, large families can rest assured everyone will be catered for from the little ones to the teens. The best extending dining table for families on our list. 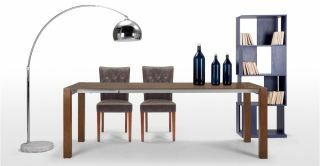 Not sure if an extending dining table is right for you? Check out our guide to the best dining tables for a list of non-extending fixed seating areas.